Relevance The Chk2 inhibitor CCT241533 was shown to produce a mechanistic inhibition of CHK2 in HT29 human colon cancer cells as well as a radioprotective effect in mouse thymocytes. In normal cells, p53 is activated by CHK2 and other kinases in response to double-strand DNA damage resulting in G1 cell cycle arrest and apoptosis. Inhibition of CHK2 may provide an antitumor effect in cancer cells, and therefore a therapeutic approach. In vitro applications CCT241533 blocked CHK2 activity in human tumor cell lines in response to DNA damage, as shown by inhibition of CHK2 autophosphorylation at S516, band shift mobility changes, and HDMX degradation. CCT241533 did not potentiate the cytotoxicity of a selection of genotoxic agents in several cell lines. 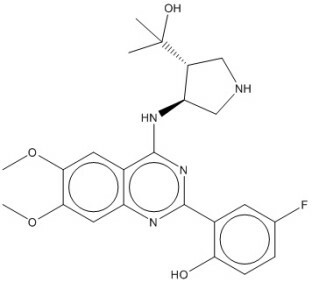 However, this compound significantly potentiates the cytotoxicity of two structurally distinct PARP inhibitors. Clear induction of the pS516 CHK2 signal was seen with a PARP inhibitor alone, and this activation was abolished by CCT241533, implying that the potentiation of PARP inhibitor cell killing by CCT241533 was due to inhibition of CHK2. Consequently, our findings imply that CHK2 inhibitors may exert therapeutic activity in combination with PARP inhibitors. Caldwell et al. 2011. J Med Chem. 54(2):580-90. PMID: 21186793. Anderson et al. 2011. Cancer Res. 71(2):463-72. PMID: 21239475. CCT241533 is a potent and selective inhibitor of CHK2 that potentiates the cytotoxicity of PARP inhibitors. Structure-based design of potent and selective 2-(quinazolin-2-yl)phenol inhibitors of checkpoint kinase 2.